Earthlings had scored moon rocks before 1970. NASA's Apollo 11 and 12 missions successfully hauled them back to study—immense scientific accomplishments, of course. One problem. It cost $142 billion in today's dollars. Russia's solution? Send a robot instead. The Soviets were the first to realize that sending a human to pick up dust is incredibly expensive, and, if you're the guy in the pod—maybe just a bit too dangerous to be worth it. Their response was the Luna 16 space probe, history's first robotic craft to successfully bring back an extraterrestrial sample. The stakes were high. To call the space race anything but a, well, race, is to state the obvious. But Luna 16's predecessor had lost a literal race, in an almost comically embarrassing moment of Space Age failure—the Luna 15 unmanned probe crashed itself into lunar oblivion, smashed on the surface of the moon, just hours before Apollo 11 began the trip back to Earth. So for Russia, it was time to get serious—and fast. A successful robo-drilling effort would require a craft that could land itself gently without damaging the sensitive drilling equipment inside. The craft itself—a byzantine mound of pods and landing apparatuses that still look like science fiction compared to today's sterilized space affairs—gracefully maneuvered onto the surface of the moon's Sea of Fertility, using a delicate pair of descent engines that stopped firing only 20 meters above the surface, before it clamped down and wasted no time drilling. 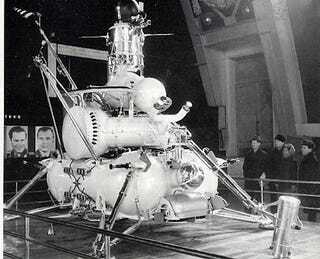 Luna 16, unlike her older sister, landed softly. Seven minutes later, the Russian digger was done, having sucked up a sample of basalt rock 35 mm deep into the moon's surface, where it would be stored and analyzed back on earth. A day later, its top section blasted off, dusty cargo inside, leaving the other half behind to record and broadcast data from the moon's surface. Luna 16's cap, carrying a scant 101 grams of lunar rock, crashed safely into the Kazakhstani steppes, carrying what was described as a "grayish brown" dust. That might sound dull, but this dust was later sold for $442,500 at auction (though not before a bit was exchanged for some NASA moon rock as a gesture of goodwill). The mission was modest, perhaps, as was the cargo. But Luna 16's legacy isn't just its onetime ability to scrape powder off the moon and scoot back to earth, but its proof that robots can do some seriously cool stuff for us. Sending robots to work in space in the 70s put mitigated the romanticized (and, during that era, heavily-politicized) dream notion of the Man In Space. Where our hands (and heads) were needed, increasingly, were on the ground, where brilliant engineers and scientists of all shades on both sides of the Iron Curtain worked to realize the fact that sometimes it's a matter of finding the right bot for the job. The incredible success of the Mars Rovers? At least in part (and in principle), thanks Luna 16—and happy 40th birthday.